Give yourself a makeover from the inside out...in just one shot a day! We all lead such busy lives, I mean, I'm the first to complain that there just aren't enough hours in the day! It's all too easy to get caught up trying to juggle family commitments, work, a social life and some sort of relaxation. Try adding an exercise regime and a healthy diet into the mix and you begin to get the picture. It's tiring just thinking about it all. Seriously. But it doesn't all have to be hard, there are small changes we can all make to our daily schedule that can help keep us healthy. For me, this now includes having a small shot or glass of Sunraysia's Prune Juice. Sunraysia Beverage Company is a proud Australia company which was founded in 1985. They remain 100% Australian owned and manufactured. Their juices are also sold in 25 other countries including Singapore, the U.K and Hong Kong and they were also the first to introduce Prune Juice to Australia. Now, I love prunes and have been eating them since I was little, either straight out of the packet or stewed over yoghurt or ice cream, they are just delicious! So when I first saw that prune juice had entered the market I was pleasantly surprised. Other than the fact that they are a great source of fibre, prunes actually contain more antioxidants than any other fruit or vegetable. Antioxidants are great because they tackle ageing by neutralising the toxic free radicals we come into contact with everyday which attack skin cells and cause nasty wrinkles. Nice! 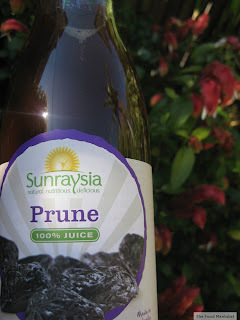 I was lucky enough to be sent a sample bottle of Sunraysia's Prune Juice and after trying it I can honestly attest to it's quality - I've since purchased and gone through two more bottles. If you like the flavour of prunes then you too will love the taste of this juice. The flavour of the juice itself is very pleasant, with just the right amount of sweetness. One shot a day is all you really need to reduce the effects of ageing, maintain a healthy digestive balance and keep your skin healthy. If you choose to have more, a 200ml glass will actually provide you with one of your daily '5-a-day' fruit and vegetables. I am also planning on developing a few healthy recipes using it too. The 2002 Journal of Women's Health & Gender based Medicine reported that eating prunes every day actually enhances the bone formation of women when compared with eating similar amounts of dried apples. Similarly, in 2011, a study conducted by Florida State University and published in the British Journal of Nutrition claim that prunes can help to prevent osteoporosis and bone fractures in us all. One thing I find difficult about choosing a good juice at the supermarket is that SO many juices are packed full of range of ingredients that...well, aren't juice! Many of them are actually full of added sugar too. No thanks. What I actually love about this juice is the fact that it contains no preservatives, no added sugar, artificial colours, sweeteners or flavours. It remains 100% prune juice. Yay! Sunraysia Prune Juice is available in most supermarkets including Coles & Woolworths and comes in 250ml (RRP $2.45) and 750ml (RRP $4.99) bottles. Thanks to the Sunraysia Natural Beverage Company, two lucky readers will win a 'make-over from the inside out' kit complete with prune juice, shot glass and loofah gloves - all vital elements to achieving healthier looking younger skin. For a chance to win all you have to do is tell me your favourite 'food inspired' health or beauty tip. The competition ends at midnight AEST 14th September, 2011. You can enter this competition once daily and it's open to anyone in Australia. drink water. thats it - wonder cure. Dont believe what you read in the papers, thats another good one! I've always loved prunes! Looking forward to the recipes. I'm a big fan of prunes. I'd say my favourite health tips are: fat doesn't make you fat and a calorie is not a calorie. Oh, okay then... macadamia oil in my bath on occasion. With some rose oil. Delicious. My secret food-related beauty product? Ground coffee, sea salt and olive oil body scrub that works wonders to remove dead skin off and I swear it minimises the appearance of cellulite. Apply in the shower, otherwise gets messy! PS Vivian - agree. We used to blend together whole egg and olive oil as hair treatments, very similar idea. 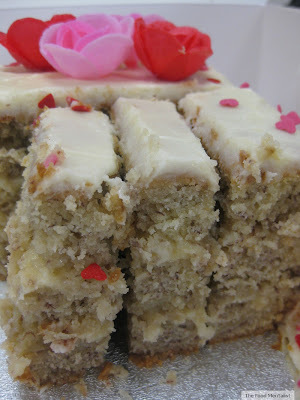 Bizzy Lizzy for her macadamia & rose oil bath tip - sounds divine! & I bet it smells gorgeous. Erin, how exciting to have won... I cannot wait for my prune/Sunraysia makeover kit to arrive. Yum!!! Thanks again!